Dr. Mark E. Richards explains how the customized combination of cheek lift surgery and Sculptra® Aesthetic can restore facial volume and reduce common signs of aging. Washington, DC—Many patients are familiar with how collagen depletion can lead to common signs of aging, including facial volume loss, states Washington, DC plastic surgeon Mark Richards, MD. Over time, he explains, the body produces less collagen and loses the youthful volume of facial fat, which can result in the development of fine lines, sunken cheeks, and other unwanted effects. He emphasizes that while everyone goes through the process of aging, each person’s physical expression of this experience will be unique. Therefore, he adds, treatment addressing facial deflation must be individualized to achieve optimal results. He says he often combines several procedures, such as cheek lift surgery, Sculptra® Aesthetic, and other dermal fillers, to help patients obtain their desired outcome. Dr. Richards explains that employing an integrated approach can be the key to reducing the appearance of sunken cheeks and under-eye bags due to volume loss, as well as maximizing natural appearing rejuvenation as a whole. To combat facial deflation he says that he typically utilizes a combination of surgical and non-surgical procedures, including cheek lift surgery and Sculptra® Aesthetic, to provide more comprehensive results. The surgery repositions the descending tissue to a higher, more youthful position on the face, he informs. He uses the dermal fillers are designed to stimulate collagen production, smooth fine lines, and restore fullness to the midfacial area and other areas such as the jawline and nasolabial folds. The combination of treatments can also help to extend the length of the effects, he adds. Ultimately, Dr. Richards believes that with a customized treatment plan, patients who are dissatisfied with their appearance due to facial volume loss and other common signs of aging can achieve more dramatic and natural-looking results than with a single procedure or fillers alone. Furthermore, he suggests that cosmetic enhancement methods should generally be tailored to suit the anatomic needs and goals of individuals in order to optimize safety as well as create immediate and long-term benefits. 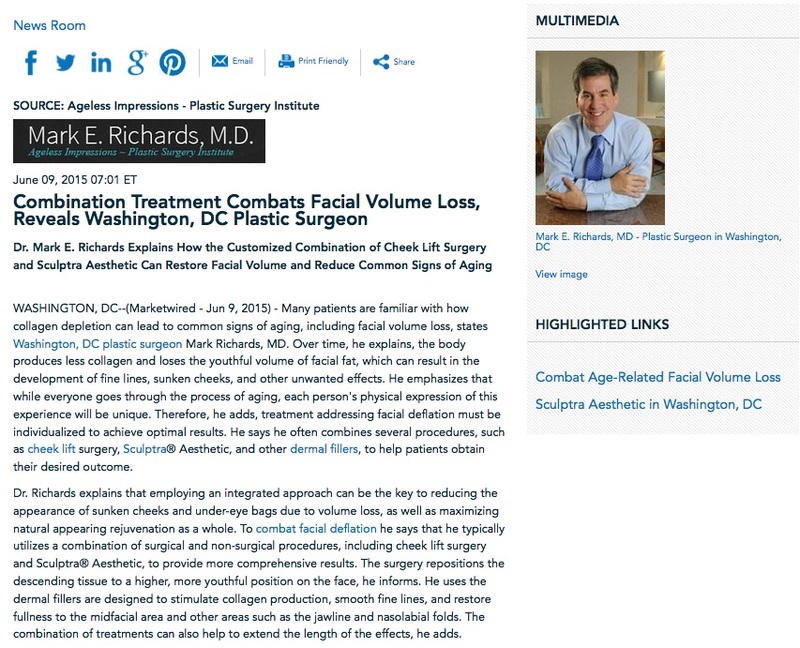 Dr. Richards is a board certified plastic surgeon and the founder of Ageless Impressions – Plastic Surgery Institute in the Washington, DC, Maryland, and Northern Virginia area. He received his undergraduate degree from Yale University before continuing on to the University of Maryland School of Medicine, where he earned his medical degree. Following graduation, he completed seven years of additional training in general and plastic surgery, and remains an advocate of continuing medical education (CME). He was certified by the American Board of Surgery in 1990 and has active certification by the American Board of Plastic Surgery since 1992. In addition to being an active member of several esteemed medical organizations, including the American Society of Plastic Surgeons (ASPS), he also served as the President of the Montgomery County Medical Society and the National Capital Society of Plastic Surgeons (the regional ASPS chapter). He is available for interview upon request.